Network Dessign | CCIE or Null! The Cisco PPDIOO Life Cycle. The PPDIOO network life cycle is something covered in the CCDA Exam objectives, and it provides a foundation on how/when a network should be implemented/designed/upgraded, of course this is a “best practice” type of thing, and people do not have to adhere to this life cycle but after you go over it a few times you have to agree it does make sense. Prepare – This first prepare phase is not very technical at all. In fact the primary purpose of this phase to justify the network upgrade. This phase will involve speaking with high level managers to figure out what business goals the company has and what products could be used to provide that functionality to the business. Example: If the customer wanted to implement a WLAN you would want to ask various questions. How many users will use the WLAN, what kind of people will utilizing the WLAN (employees/guests), what kind of applications will run on the WLAN, required WLAN security (Do any compliances have to be taken into consideration SOX, HIPPA, etc), what kind of speeds will be required, and so forth. Then you would want to look for products that meet the customer’s requirements. Example: Your customer wants to implement an 802.11n WLAN, their are going to be a few things you want to verify (or plan for). Does the customer have 802.3at compliant switches to provide the required amount of power to operate 802.11n radios, does the customer have 1 GB switches to connect the AP’s to. It would also be wise to verify the network backbone will be able to handle the new traffic load. Also in this phase you will want to perform a site survey to locate sources of interference and existing WLANs. Design – This is where some of the fun begins. Based on the business requirements (from the prepare phase) and the technical information (from the plan phase) you can begin designing the new network topology. The design you create in this phase will contain everything (IP Addressing, VLANs, Redundancy, Security, etc) you are going to need for the project and be referenced throughout the rest of the project. Example: After performing the site survey, and inventorying the customer’s network you design a plan for customer to purchase multiple dual band 802.11n AP’s, the required amount of 802.3at compliant switches, dual WLC’s for redundancy, along with RADIUS software for security. You also provide and updated network diagram concerning how/where the new equipment will combine with their existing network. Example: The new switches, AP’s, RADUIS software have been purchased and have arrived at the customers site. You follow the implementation plan and begin the installation of the new switches, then setup the two WLCs, deploy the AP’s, verifying the AP’s power up and join the WLC as each of them are deployed, also testing WLAN client connectivity. You then proceed to setup the RADIUS server and configure the WLC & AP’s to authenticate through the RADIUS server, then verify client connectivity again. Operate – The network has been deployed and is being utilized by the end users. Appropriate support personnel are also monitoring and maintaining the network. In this phase it is acceptable to perform software updates and monitor the overall health of the devices/links. Example: The WLAN is fully configured and now end users and guests are able to bring in their laptops and PDA’s. They successfully associate/authenticate to the WLAN and access the company resources, all the while being mobile. 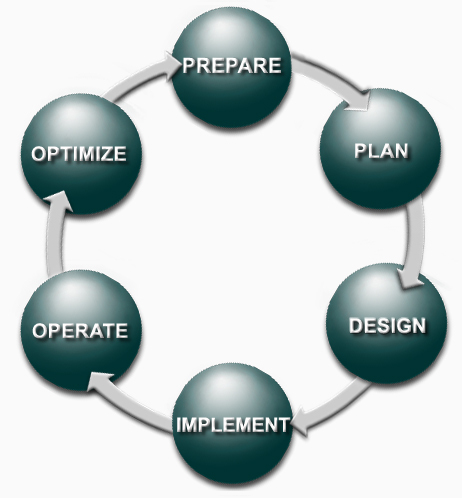 Optimize – In this phase the network is proactively monitored & changed to improve performance or resolve issues. These changes can be minor or major depending on the amount and type of issues that occur. If the changes are big enough this life cycle could begin again back at the prepare phase. Example: WLAN users in a particular location are experience slow wireless performance and are disconnected from the WLAN multiple times throughout the day. Support personnel show up with a spectrum and protocol analyzer to investigate the issue, it appears a new cordless operating at 5 GHz has been placed in this area that was not previous there during the site survey. This leaves 2 options advise management to have the cordless phone removed, or move the users to another frequency that is uneffected by the phone. Well, there is a quick and dirty look at the PPDIOO life cycle. More information can be found in Cisco’s design curriculum or Cisco Press’s network design publications. I would also like to add the examples I provided are merely that, simple examples real projects require much more documentation and detail.